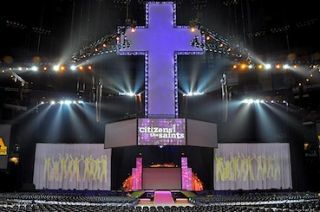 The tri-annual gathering of the Evangelical Lutheran Youth of America (ELCA) took place in late July at the Mercedes-Benz Super Dome in New Orleans, and the 35,000 plus teenage attendees once again were treated to praise activities, theatrical and musical performances, and the ultimate Yamaha and NEXO audio system thanks to the production services of Gand Concert Sound (GCS) of Glenview, IL. Christian acts including Rhema Soul, Lost and Found, Jimmy Buffet guitarist Peter Mayer, and GRAMMY winners Switchfoot performed. For its fourth time supporting the youth event, Gand provided a flown system comprising 60 NEXO GEO T speakers, 18 GEO S12, eight RS18 Ray Subs and 30 ground-stacked CD18 subs. Fifteen NEXO 4x4 amps were utilized to power dozens of NEXO PS15 and PS10s used for stage monitors and front fills, and PS8s used for under balcony delay speakers, as well as S12s and RS18’s. Additionally, GCS used the new Rupert Neve Designs Portico 5045 processor developed specifically for Yamaha on specialty mics for added clarity. “We were able to achieve a great sound in one of the USA’s largest venues,” said front of house engineer Adam Rosenthal. In addition to the July ELCA mega event, GCS also supplied audio production for the Pitchfork Fest in Chicago and dozens of other events around the Midwest.